South Korea’s package delivery system made a quick progression counting up to the Millennium as Cable TV as almost 50 channels finally added on the mininscule FOUR existing national TV channels . their shopping channels needed next-day delivery as well as quick return and exchange system, when an all-out war was on between the conglomerates who ran them . as if this wasn’t enough, quick-service ensued, delivering within an hour in-town via motor-cycle . and this evolved more as cable turned to the age of internet shopping malls On-Line, over the Millennium, with more affordable same-day express around satellite cities, of which a couple have now formed around the Capital of SEOUL . and as belated South Korea is in instigating its own bullet train, some time there-after began their same-day express delivery . in its purest form it is a drop-off and pick-up service between KTX stations throughout the Peninsula – and quite cheap almost the price of next-day registered postage with insurance . this gets better if you add their option of quick-service linking KTX station with point of departure or delivery via motor-cycle and van for larger boxes, by when this gets quite expensive . so consider end-to-end between furthest KTX station takes less than 3 hours, then less than an hour by motor-bike around town so most package can be delivered to key areas in less than four hours .. and it did for me from SEOUL to Busan or Pusan . 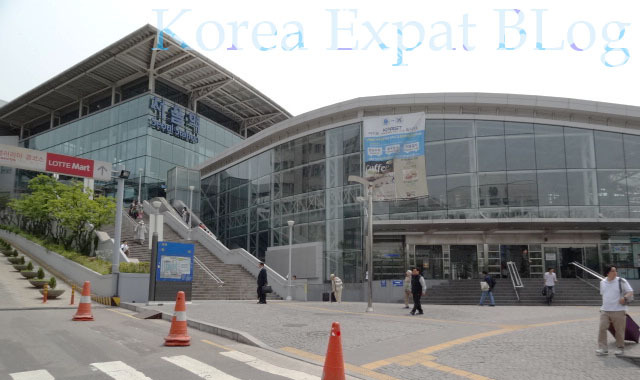 KTX drop-off or pick-up point in SEOUL Train Station in accessible toward its rear entrance on its West Side, thus known since its humble days as SeoBuYeok (meaning West-side station). and upon entering : a floor-ip takes you to KTX bullet train ticketing, and far-below is Airport Express Train to inCheon Airport . but for the Special Deliver you stay on the ground floor and straight-ahead : go-out the door to outside leading to no-where except actual railways – though you cannot ride through here (but THEY can simply toss your package over the fence onto the waiting trains). this is a small operation not even many locals know about so expect a single clerk or two to accept our hand-over your package . as explained on my KTX Page on top menu : express bullet trains serving South-East to Busan or Pusan departed from and arrived at SEOUL Station, while those heading and coming from South-Western cities like GwangJu or MokPo departed and arrived in YongSan Station, but now it is a queer mixture so check their time-table and below is their office in YongSan KTX Train Station, one level-up from the ticketing area which is already up on the thrid floor of this massive multi-complex . and weighing less than 10kg. they have two Official websites for calculation and reservation, one with English URL and a Korean URL .